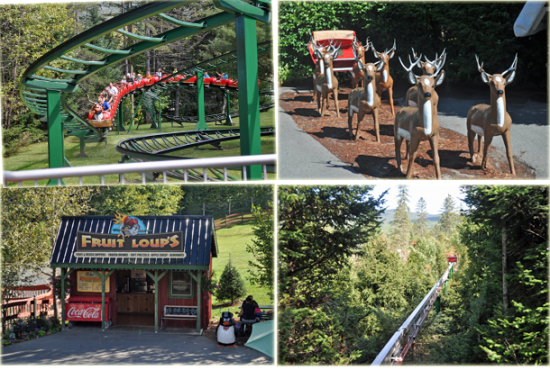 Planning a family trip to the White Mountains with kids? 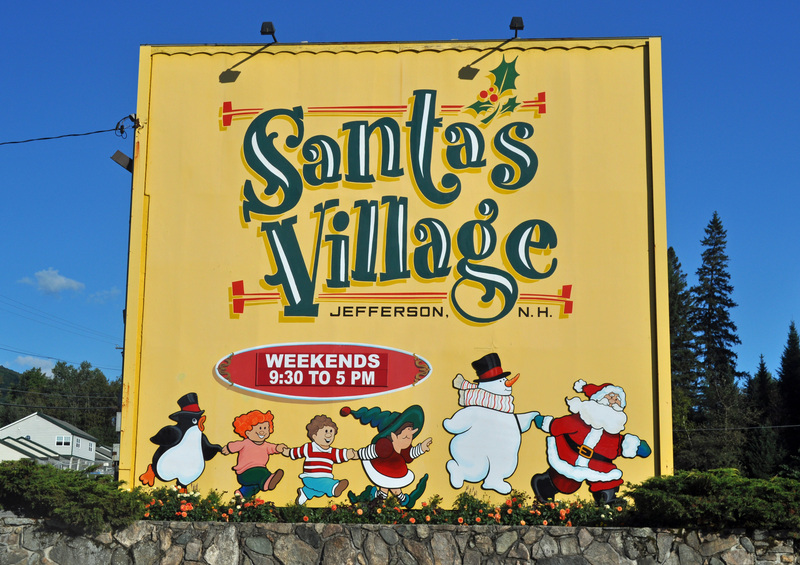 Make sure to add Santa’s Village on your list of must see attractions. 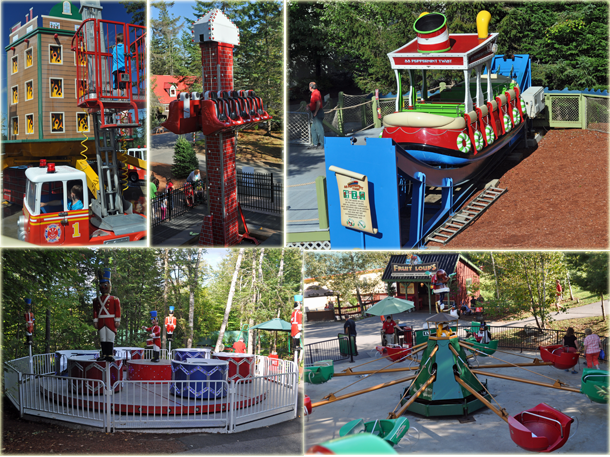 There’s fun for the entire family at Santa’s Village in New Hampshire. 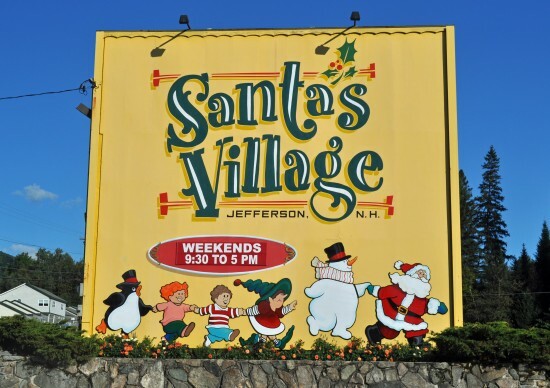 About 20 years ago my family took a vacation to Santa’s Village in Jefferson New Hampshire and while I do not remember the trip itself, I often look through our scrapbooks and from the expressions on my face, I can tell it was a fun time. Living in New England I had been wanting to bring my family there for while, and in 2014 we planned our first visit. We have been there many times over the past few years, even purchasing season passes in 2015 and every time the kids look forward to the visit. One of my favorite parts is the photo opportunities, and updating our family pictures year after year. The lines in the summer can get busy, so I try to plan around less popular days. One of my favorite times to visit Santa’s Village and Santa Claus is the 2nd weekend of September which is usually fairly empty. The longest wait we experienced this past year was at the Christmas Ferris Wheel but by early afternoon there was practically no wait at any ride the boys wanted to go on. Most rides including the S.S. Peppermint Twist, Hot Shots Fire Brigade, The Chimney Drop, The Skyway Sleigh, Yule Log Flume we were able to go on numerous times in a row if we wanted as there was no line. There was plenty of room at the shows, we watched Santa’s Light Show, and there was no line to visit with Santa himself either. Unlike StoryLand where an adult has to go on every ride with children under 48 inches, children only have to be 42 inches to go on most rides by themselves at Santa’s Village. A few of the rides, like the Yule Log Flume, they need to be over 48 inches to ride alone. With both children over 42 inches but under 48 inches this requirement was convenient as Jonathan is not as big into rides as Trevor. Trevor was able to go on a number of rides by himself, while Jonathan and I watched. 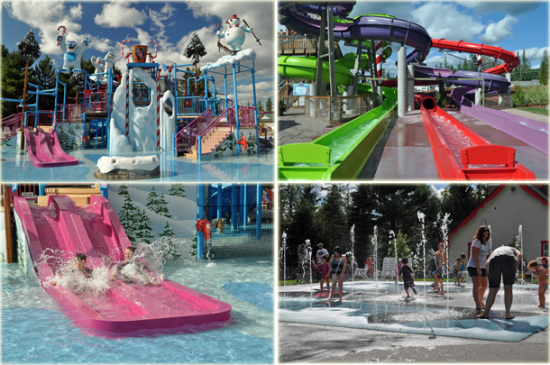 Lockers are available at the outdoor water park, but instead of paying the locker rental fee I decided to save the water slides and splash pad area for the end of our visit. After our picnic lunch near the parking lot I packed their bathing suits, towels, and flip flops into the backpack. Upon entering the amusement park, stop by the Elf University (located on the right after you enter) so your child can pick up a punch card and play the free Elfabet game. While walking throughout the park you will notice Elfabet stations, find all of the letters, A through Z, punch your card, then return to Elf University to receive your certificate and a small prize. The Elfabet Game was the highlight of our visit, as the boys would run in excitement to get their card punched every time they spotted an elf. Stop by and visit with the reindeer, while your there you can purchase small snacks to feed them or if you prefer just pet them. 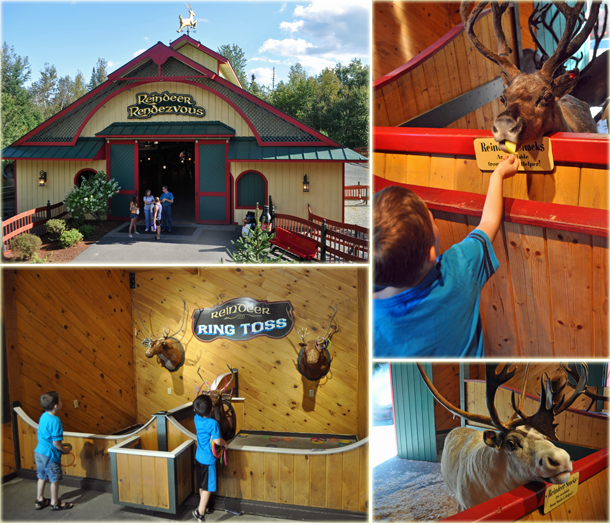 While visiting the Reindeer Rendezvous, learn facts about the reindeer, and even play a few free Reindeer games. Can you bring in outside food? While food is available, outside food can be brought in and we opted to pack a picnic lunch and drinks. There are picnic tables located inside the park as well as in the parking lot. If you head out to the parking lot during the day, make sure to get your hand stamped so that you can re-enter. You can leave and re-enter as many times as you’d like. We left the cooler in our trunk and decided that when we left the park to eat lunch we would pick up our bathing suits as the boys wanted to check out the outdoor Water Park. Can you guess what this is? A trash can! I never noticed any trash laying around, the park was so clean. A plus side to having the trash covered is it limits the amount of bees you have swarming around. 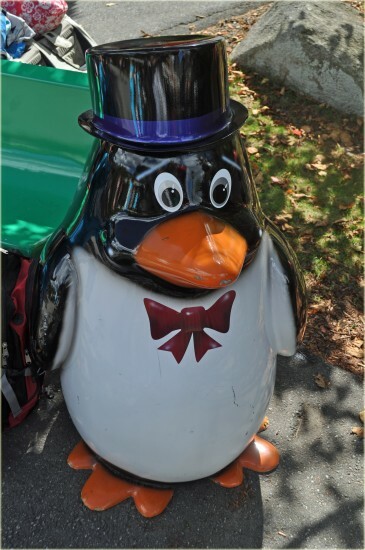 While the park is only opened on weekends throughout the end of September and beginning of October, and select November and December weekends there are two additional fun events planned before the end of the year where the park will be opened for limited hours. Bring your children to celebrate Halloween as the theme park is turned into a magical Halloween Adventure. Halloween at Santa’s Village is only on select days in October. Celebrate New Year’s Eve at Santa’s Village on December 31st from 4pm-9pm. Ride your favorite rides one last time, see fireworks, and enjoy food and soft drinks. The ticket for the event includes unlimited food, soft drinks, rides, and all of the activities. From North Conway and Seacoast NH: Take Route 16 North through Pinkham Notch into Gorham, NH. Turn left at the stop sign to remain on Route 16 N. At the first set of traffic lights turn left onto Route 2 West and drive for about twenty miles until you arrive at Santa’s Village. Take I-93 North through Franconia Notch to Exit 35, onto Route 3 North. Go through Twin Mountain, through one set of traffic lights. Turn right onto Route 115 North. At the stop sign, turn left onto Route 2 West. Drive about four miles to Santa’s Village. Additional directions to Santa’s Village. Check out Santa’s Village hours, plan your family getaway to the White Mountains and purchase tickets by visiting https://www.santasvillage.com. Stay connected with Santa’s Village on Facebook.